Explaining the confusion of who owns a Greater Baton Rouge home appraisal for a home mortgage. No, it’s not OK for you the buyer of a home to believe you can “shop” for a better home loan deal once you’ve applied for a mortgage with one lender and they’ve ordered their appraisal you’ve paid for… You can, just realize that lender’s appraisal is not “transferable” to another lender should you find a better lending deal, perhaps one with lower closing cost or a better rate. And, if you apply for a home loan with that second lender for the same home, you’ll be paying for their new appraisal. Earlier in 2017, a local mortgage broker called demanding I “transfer” my Greater Baton Rouge home appraisal performed for a house purchase. Apparently the original lender was not able to close the loan. It was obvious to me, this mortgage broker had no remote clue Appraisers are governed by USPAP (Uniform Standards of Professional Appraisal Practice) nor of the confidential relationship between the Appraiser and lender. When I stated I was not able to “transfer” my original appraisal engaged by and completed in confidentiality for lender X, the mortgage broker’s response was, “Thanks for the response; however, the borrower’s have ”paid” for this appraisal already and their original lender can not get the loan closed, which we are able to do. And you’re saying you still will not transfer the appraisal per their request?” However frustrating this may be to home buyers obtaining a home mortgage through a lender, what happened here is the buyer paid for the lender X’s appraisal, not “their appraisal”. A Baton Rouge home appraisal is owned by the party engaging the Appraiser to perform the appraisal. In this situation above, Lender X engaged me to perform a home purchase appraisal therefore the appraisal is owned by that Bank and I am legally bound in confidentiality to that lender. This situation is totally different from your hiring a local Appraiser on your own. This week, my Appraiser friend and colleague, Tom Horn, SRA with Birmingham Appraisal Blog, explained in detail who owns the appraisal in various situation. I invite you to read Tom’s article. I paid for the appraisal so why can’t you give me a copy of it? This is a frequent question I get from homeowners who want a copy of their appraisal report. 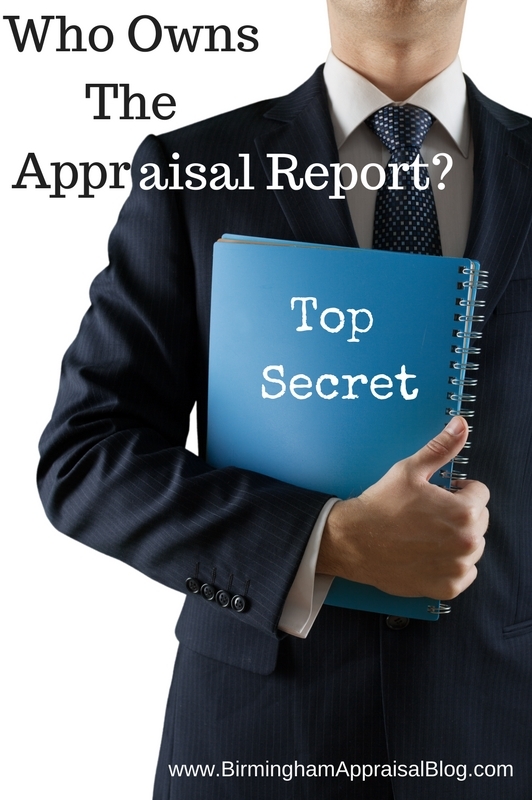 Today I want to clear up this confusing topic about who owns the appraisal report. This entry was posted in 20 Most Popular Articles, 20 Most Recent Articles, Home Appraisal Education, Home Appraisal Process, What is USPAP, Who Owns The Appraisal and tagged lender appraisal, uspap, who owns appraisal by Bill Cobb, Appraiser. Bookmark the permalink.